If you follow my Facebook page you'll have seen that the sudden bluster of winter weather spelt disaster for my nails. They all broke. So I decided to "embrace" the weather and cut my nails down to nubbins and plied them with plenty of tlc. It was my every intention of keeping them naked for the remainder if November but when I decided to go to the opening day of the Belfast Christmas Market I couldn't show up with nakedness. 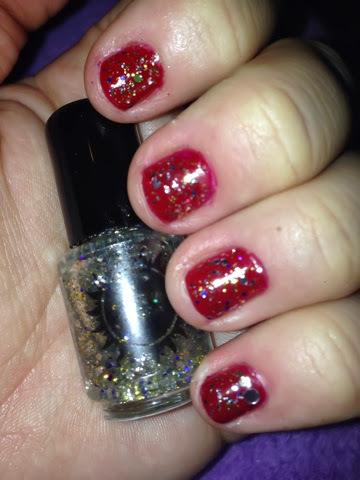 This required some red and glitter, stat! 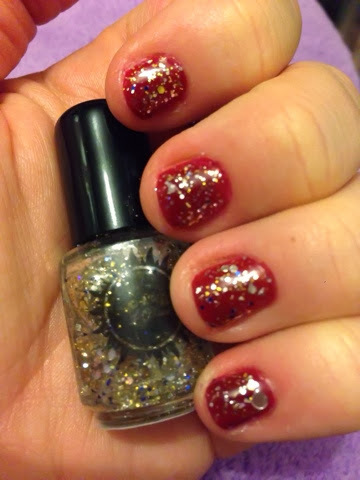 So this is what I ended up with Golden Rosé 63 topped with 365 Days of Color - The Diadem. A collection of gold, silver and blue glitters. I love this combo as the red really helps the blue stand up.